With Easter fast approaching, it’s time to start planning your annual Easter egg hunt games. Whether you’re a master at writing cryptic Easter egg hunt clues, or a pro who can sniff out hidden chocolate from a mile away, Easter egg hunt games are an enjoyable treat for the whole family. So, to help make this Easter eggs-tra memorable, we’ve put together this list of five fun Easter egg hunt games. These unique and creative Easter egg hunt games are fun for the whole family, and will help you have a safe, happy, and above all else, chocolatey Easter! All that glitters is gold thanks to this Willy Wonka inspired twist on the classic Easter egg hunt. To pull off the perfect ‘golden ticket’ Easter egg hunt, start by hiding Easter eggs around your house. What sets this Easter egg hunt game apart, however, is that in addition to hiding Easter eggs, you will also hide a special golden ticket. You can either hide the golden ticket inside one of the Easter eggs, or hide it separately and make it the grand prize at the end of the Easter egg hunt. Whoever finds the golden ticket can redeem it for an awesome, chocolatey prize! Trust us, this Easter egg hunt game is as good as gold. The great outdoors is a great setting for an Easter egg hunt. 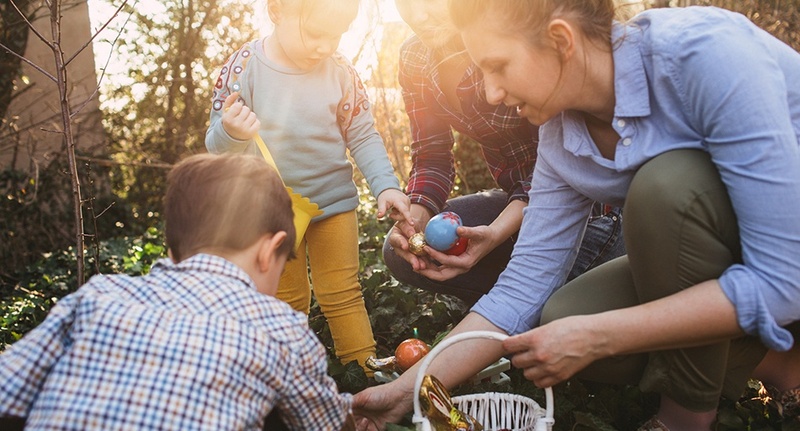 If hiding Easter eggs in the same places around your house year after year has gotten stale, then it might be time to embrace mother nature and have an Easter egg scavenger hunt. For a scavenger hunt to remember, hide a variety of unique Easter eggs (e.g. an Easter egg with polka dots, a striped Easter egg, an Easter egg filled with jelly beans) around your backyard (you can use a public park if your backyard isn’t suitable). Next, give your children a list of scavenger hunt items to find and set them loose. If they can tick off every item on their scavenger hunt list, they win a prize. Simple, yet oh so effective. Let the hunt begin! If you’re looking to add a touch of adventure this year’s Easter egg hunt, why not create a choose your own adventure hunt? In a normal Easter egg hunt, you receive a clue which leads you to the next Easter egg. A choose your own adventure style Easter egg hunt takes this to the next level. Every time you find an Easter egg, you receive two clues and have to decide which path to follow. Much like a choose your own adventure book, this is a great way to keep your kids excited and engaged throughout the Easter egg hunt. Ready, set, adventure! What Easter egg hunt prize could possibly be better than chocolate? Maybe a later bedtime for a week? No chores for a day? Unlimited TV for a weekend? In this high-stakes Easter egg hunt game, you get to flip the script and let your kids’ imaginations run wild. Your children set the rules for this Easter egg hunt game. They hide the eggs, they write the clues, and, most importantly, they create the rules. Put simply, your kids get to write something they want (i.e. no chores for a day) on a piece of paper. Then, they attach that piece of paper to an Easter egg and hide the egg. Once all the eggs have been hidden, set a time limit and begin searching for the eggs. The catch? For every egg that you don’t find within the time limit, your kids get to do whatever is written on the piece of paper attached to that egg! This high-tech variation on the classic Easter egg hunt is perfect for older children and teenagers who are beginning to lose interest in the yearly Easter egg hunt. For this awesome Easter egg hunt game, you swap traditional written clues for QR codes. Before the hunt starts, participants will download an app which scans QR codes on their smartphones. There are heaps of apps like this, so take your pick! From there, many online resources allow you to print off QR codes and corresponding Easter egg hunt clues. Or, if you’re particularly tech-savvy, you can create your own QR codes and Easter egg hunt clues from scratch. Whenever someone finds an egg, they use their phone to scan the next QR code. The corresponding clue will then show up, leading the hunter to their next chocolatey surprise!